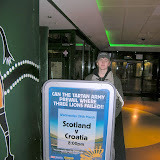 The highlight of the trip for my boys was the match Scotland vs. Croatia. They were thrilled to be there and although the players didn't play as they hoped they would, it was spectacular. Sanja, Iva and I discussed possible ways of spending the evening without our football fans. Restaurants and pubs were out of question, since they don't let kids in, which came as a huge surprise to my older son, who's used to going to pubs and having a pint of beer occasionally, in spite of the fact that he's under age. It didn't take us long to decide what to do: shopping without haste in Ikea and the nearby shopping mall, the only place open till ten. It was not busy at all and we indulged ourselves with little somethings. The lady at the Travelodge spoke Glaswegian. We could hardly make out what she was saying. She was nice enough, though, as to repeat three times until it dawned on us that in order to get to the centre, we should turn left at the third traffic lights. Or something along those lines. And finally we reached the destination of our trip. Glasgow awaited us with a light drizzle and heavy traffic on busy motorways - or is it dual carriageways? How should I tell the difference? Anyway, whatever it is, it's full of ramps and entrances and exits on both sides, - and what's more - all the time you're above the ground, driving over bridges and viaducts, or at least it seemed so to me. It was evening when we finally got to our hotel. It was a Travelodge on Paisley Road, an unprepossessing little hotel, but who am I to complain for 29 pounds a night for the four of us. We never spend a lot of time in hotels when we travel anyway. Luxury is not an issue, what we need is just a clean place to sleep. And this was clean, although the sheets didn't have that fresh smell of being washed with a familiar soap powder. But as I said, the room was all right for the two nights in this modern city. It was a short drive from the Forth Bridges to the Falkirk Wheel. That's a boat lift, the one that revolves, and it's really awesome. It connects the Union Canal with the Forth & Clyde Canal near the town of Falkirk. The level difference between the two canals is 35 meters, which suggests the hugeness of this rotating boat lift. Built in 2002, as part of the Millennium Link, it created an uninterrupted link between the cities of Glasgow and Edinburgh. I'm sure this would be a pleasant cruise. Mislav had a déjà vu experience on the spot. He was sure he'd already been there. He knew where the lift was, how it worked, everything. It was amazing. Back home, however, he was able to trace the sensation back to a power point presentation in a physics lesson.